I once heard that happiness is laying under a tree and looking at the sky through the leaves. While that sounds like time well spent, the author of those words didn&apos;t quite have it right. This summer, take some advice from the trees themselves; go out on a limb, leave your house, and climb the trees of Hamilton County. The county has no shortage of forests to frolic in, but I am going to highlight three must-see spots for this summer. If you haven&apos;t been to Flat Fork Creek Park, you haven&apos;t been out much this year! The newest of Hamilton County&apos;s parks in Fishers, it&apos;s well known for having the best sledding in the area. Now that the sun is shining, the big hill is really just an obstacle in your way to the sweet stuff. Climb over the hill, cross the bridge, and head back into the woods to tour the three separate tree houses that line the hiking path. With their simple design, these platform "houses" allow kids and adults to engage in imaginative play. It&apos;s the perfect place to take the family for an epic game of capture the flag or just a wild walk-in nature. As a member of Conner Prairie I am excited to tell you about this next stop. 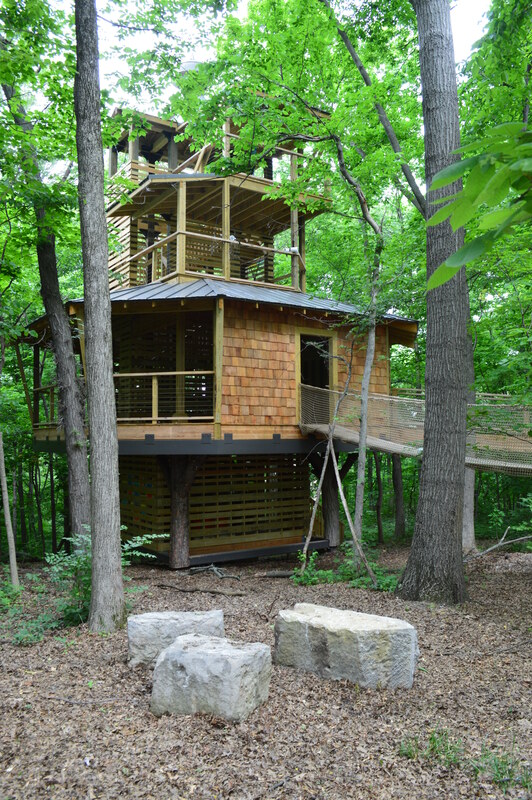 You have likely heard all about Conner Prairie&apos;s newest exhibit, Treetop Outpost, but if you haven&apos;t: listen up. This new exhibit features a multi level building with natural materials, art projects and musical instruments in addition to the much anticipated nature walk. Conner Prairie is always an excellent location to take the family but with this new exhibit it&apos;s likely to interest not only the science and history buffs in your family but the hands on artsy adventurer as well. If you haven&apos;t been to Conner Prairie lately, there has been no better time to stop by. 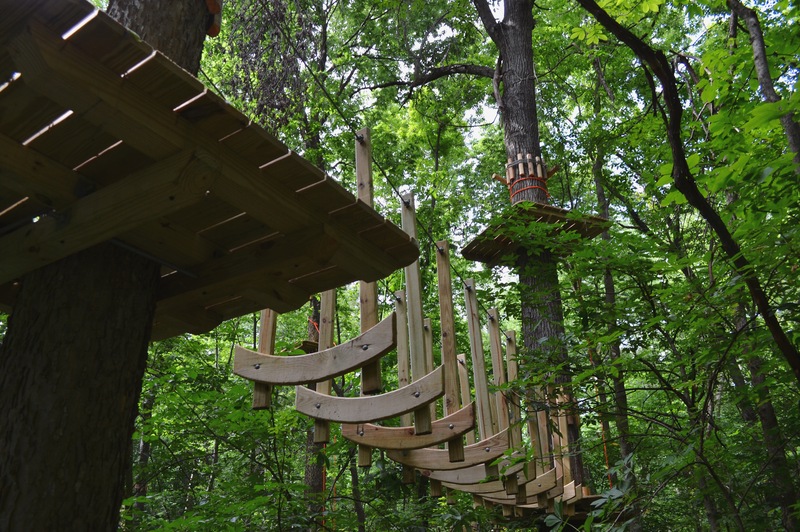 Lastly and very possibly my favorite: Hamilton County&apos;s first treetop and zip line experience is set to open this month. 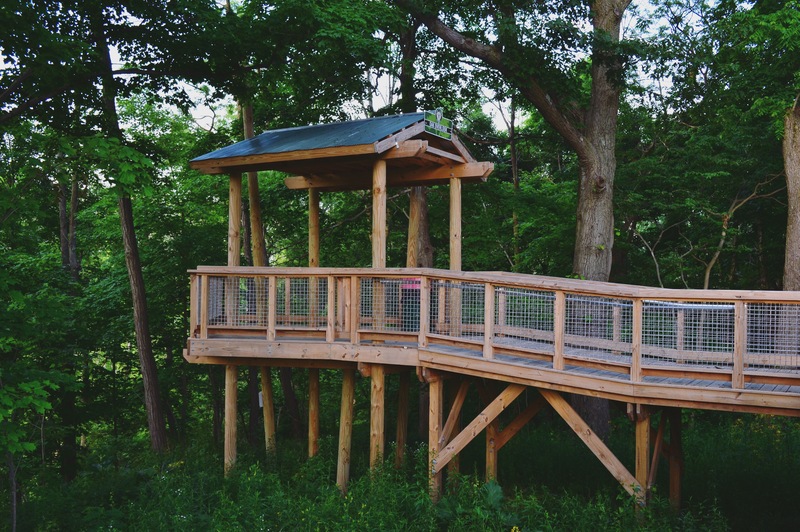 The Koteewi Aerial Adventure Treetop Trails at Strawtown Koteewi Park boasts three different levels of treetop awesomeness. Suit up in your safety gear, get a quick lesson from your guides, and then you&apos;ll be ready to belay your way across the canopy. You can choose from a comfortable 12 foot height (good for the children) or double that for the extremists out there. If you&apos;ve never been out to Koteewi you&apos;re going to want to go now. Not only does it boast some of the most amazing scenic views of our prairie home, but with the addition of new zip-lines, guests will be able to see this breath-taking view in a whole new way. And most importantly it will give us thrill seekers something new and fun close to home! Grab a group of friends and go walk among the hardwood.